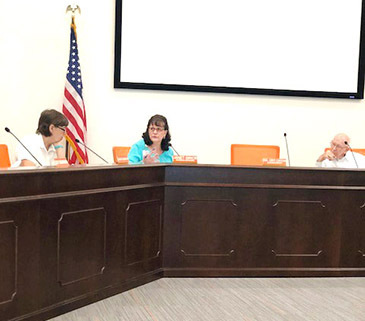 The Artesia Public Schools Board of Education held an emergency board meeting this morning at which business manager Janet Grice, center, sought the board’s approval for a budget adjustment request for additional State Equalization Guarantee/Maintenance of Effort revenue in the amount of $216,168. The additional monies were approved by the legislature in February but only issued by the Public Education Department Thursday. That left the board rushing to place the funds into the school’s budget by the end of the fiscal year: today. Grice reported the monies will be put into the school’s operational budget. The board approved the request. Also pictured are board member Cherie Widmayer, left, and board president Lowell Irby.